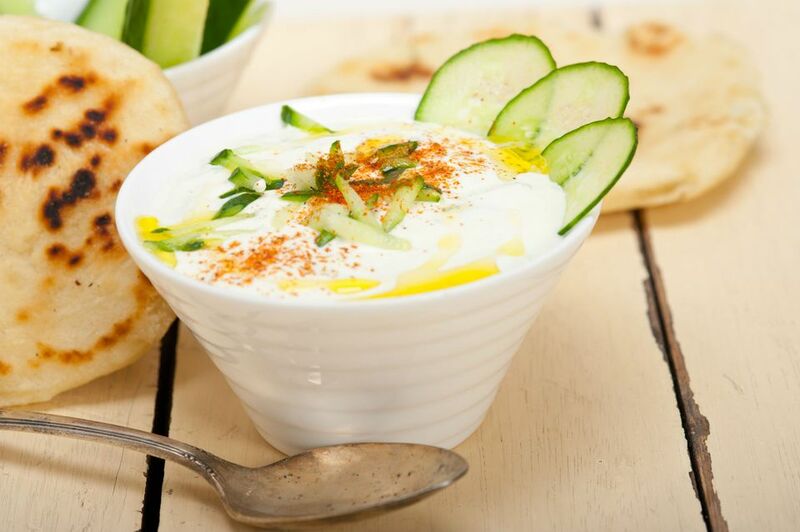 Tzatziki is a traditional Greek dish with a yogurt base. It is usually served with bread at the start of a meal, or used as a condiment on sandwiches or gyros. This vegan tzatziki recipe can be made with either soy or coconut non-dairy yogurt and plenty of fresh chopped mint for tons of fresh flavor. This easy swap to a non-dairy yogurt means you don't have to give up this traditional favorite. If you grow your own cucumbers and mint, you can use them for this recipe and enjoy it as part of your summer garden bounty. This recipe recommends peeling the cucumbers, which is needed if you are buying them in the supermarket and they have wax on their skins. But if that isn't the case and you don't have trouble digesting cucumbers, you don't have to peel them. To make the finished tzatziki less watery, be sure to drain as much juice from the cucumbers as possible before mixing with the other ingredients. Give them a good squeeze with your hands. Another tactic is to salt them, let them sit for a bit, and then squeeze out the extra liquid. Mix all ingredients in a bowl: combine the yogurt, diced cucumbers, garlic, lemon juice, olive oil, salt, pepper, fresh mint, and paprika, stirring well to combine. Chill the tzatziki in the refrigerator for at least an hour before serving to allow flavors to mingle. Taste and adjust seasonings. Give it all a quick stir again just before serving. Tzatziki should be served cold. Refrigerate any leftovers as soon as possible in an airtight container. Tzatziki can be stored for up to five days in the refrigerator, but you will find that it quickly becomes watery no matter how much you tried to get water out the cucumbers. For this reason, it's best to enjoy it the day it is made. You can serve or use the tzatziki in many ways. It can be a refreshing dip to serve with pita or chips as a snack, great for summer on the patio or at poolside. It's far lower in fat and calories than many other kinds of dip. It also makes a tasty spread on many kinds of vegetarian sandwiches. If you want to make a Middle Eastern meal, include it with other vegan versions of traditional foods, such as homemade hummus and baba ghanoush.